When you launch a business, it’s a good idea to study who your competitors will be. You’ll want to make sure you differentiate yourself in the type of products or services you sell, the way you sell them, and how you brand your business. If there is no clear difference, customers will generally choose the least expensive option, and it rarely makes sense to position yourself as the cheap choice. When you’re a small business, you are most likely competing against other small businesses, not the Fortune 500 or the mega-franchises of the world. When you look around at your competitors, and you should as you develop your branding, it’s most important to focus on your realistic competitors, but you should also consider aspirational competitors. What is an aspirational competitor vs a realistic competitor? 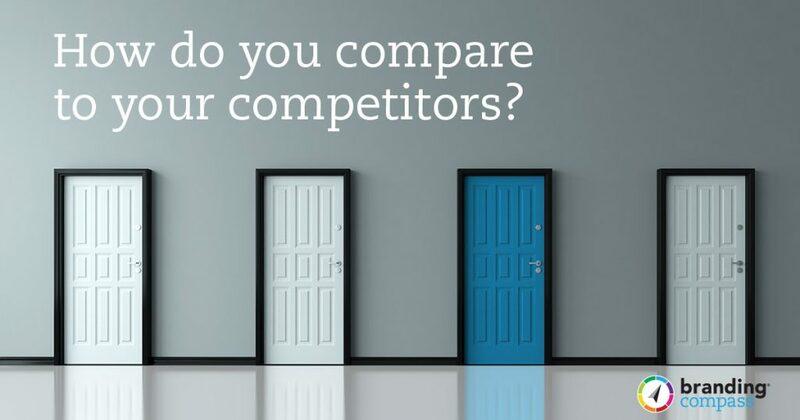 Realistic competitors are the ones that are on par with you in terms of geographic reach, revenues, employees, breadth of services, etc. An aspirational competitor is someone that you may not be directly competing with now but hope to be someday as your business grows. Imagine you own a local CPA firm. Looking at other local and regional accounting firms should be part of your business planning and branding research. But comparing yourself to huge firms like KPMG is really not that relevant. You are pursuing different clients and would describe your strengths very differently. However, if you have very big plans for your product or service, then you should think big in your competitive review. Remember, everyone starts small. Starbucks started with one coffee shop, Clif bars were sold at local bike races at first, and AirBnB started with two guys renting out the air mattresses in their apartment. If you have plans for national distribution of your consumer good, building a national chain of stores, or striving for the Inc. 5000, you’ll need to act and look the part. In this case, definitely keep those gorillas in your sights. It would clearly be a mistake to develop a brand that was confusing or out of line with your future competition. Another important reason to consider the market leaders is that they set expectations for everyone underneath them. For example, if you own any type of e-commerce business, you are likely affected by Amazon. Let’s imagine that you’ve developed your own line of flower pots and sell them online. Your first instinct is to think of local nurseries and flower shops as your competitors. But, many of your prospects are accustomed to buying online from Amazon. Online buyers now expect detailed product listings, insight from customer reviews, and maybe even free shipping. Also, there are certain “norms” about how Amazon lists the product and funnels people to the shopping cart. Any process that is different from this may feel uncomfortable and suspicious. Finally, you definitely want to think twice about a brand that focuses on a black + orange/yellow color palette or a little friendly smile. If you’re an online retailer you’ll get compared to Amazon. If you own a coffee shop you may get compared to Starbucks. If you’re a solo lawyer, you will get compared to the big law firm in town. The best option here is not to focus on your shortcomings, but on how you are better. People may be looking for personalized service, higher quality, local suppliers, etc. Promote what makes you better and create a brand around that unique benefit. Key Industry Participants. There may be other businesses, organizations, or products that are well-known in your industry, so you should consider them in your list as you figure out how to create a distinctive brand image. For example, is there an industry trade association that everyone is familiar with? While you may not be competing with them, if your name, logo, or visual style is very similar it could be confusing. Other businesses with similar names. Sometimes there is another business, offering a completely different product or service, that has a similar name to yours. In this case, take extra care to develop a brand identity that is very distinct from theirs. Make sure your logo and colors are different and make sure your website quickly says who you are in a way that people will understand they are in the right place. Tip: You’ll be asked in your Branding Compass workbook to list your competitors. In addition to your direct competitors, definitely include aspirational competitors. You may also want to list other important industry participants. Note: you will need a Pro or Premium license to receive the competitors review as part of your report.